That is a picture I took the other night at the Village Inn in Akron. It is beautiful! The sunlight was just so. I felt as if I were in France! To be honest that was partly because we drove and drove and drove to get there. Akron is far. Here is a picture of the front of the Village Inn in Akron. Here is Howard in front of the Village Inn. My mother and my friend Gary and I went first in the Vic and Howard followed in the ZR-1. Howard has this great ZR-1 Corvette but I never ride in it. The last time I rode in it was 2004! The trip to the Village Inn was dramatic because half way there we realized we did not know where we were going! "I think you turn left at a McDonald's onto a route that is 90-something," Gary said. "I want to say 98." We were on Main Street in Williamsville. Then he and my mom start gabbing about something as if nothing is wrong. And I am trying to get my mind around the enormity of this potential problem. Because here I am with my mom with me and Howard maybe following us, who knows. "Gary," I said. "I thought you drove here before." "No, Lou drove," he said. Lou is our jam session buddy. "He was coming from a different direction and he took North French and all these other streets." Do not get me around North French. I was about North French the way Leonard Pennario was about this one street in San Diego. Everyone has a street which, you go anywhere near that street, and you get lost. Sometimes you get lost just thinking about that street. But all's well that ends well and we got to the Village Inn! Although we had to backtrack once because we got distracted by the Octagon House. 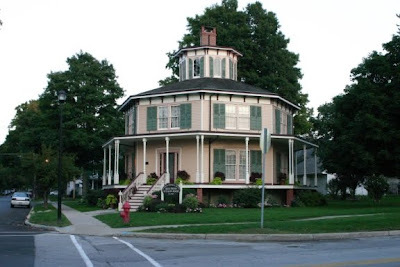 There is an Octagon House in Akron! Because of that detour and subsequent near-crisis, Howard arrived only five minutes after we did although we left an hour earlier. I give you Howard and Gary dining at the Village Inn. Fueled by the large crustacean he played the piano afterward. In the background if you look carefully you can see lounge sensation Guy Boleri who entertained during dinner. It was an eventful evening, at the Village Inn! Alas, now it is the week as opposed to the weekend, with onerous things to do. For one thing I have to go get a flu shot. Howard is bugging me about that. "Don't let that get like the snow tires situation," he said. Meaning, I never did take the snow tires off my car and now here it is fall, with winter right around the corner, so why bother. Last time I got a flu shot I felt as if my arm was going to fall off. Howard and our friend Lizzie and I went and got the shot at Tops and I remember walking out going, "Ow. Ow ow ow ow ow ow ow." Like James Brown! Perhaps this year will be more kind. Yeah, I bet you could do a mean 'James Brown', lol. And what about the 'Charity Wine Event' on the 26th? Knowing you and Gary will be going back for that noble cause. Think about getting yourself a Garmin #200 GPS for the car (about $129). That is what I did for my recent trip and I love it! Why doesn't Gary have the courtesy to take his hat off in a restaurant?